Many people are surprised to find out every first aid kit has different contents and uses. Of course, there are standard first aid kit products every kit usually has. But, there are also a ton of extra items that certain first aid kits have. That being said, continue reading to discover the types of items you can expect to find in general, car, and outdoor first aid kits! Let’s start with the basics! Most first aid kits you find in pharmacies or super stores are general first aid kits. You may ask yourself, “How can I tell the difference between first aid kits?” Well, general first aid kits are usually on the smaller side and only have a minimum amount of products that are meant to treat minor injuries or tend to major injuries while professional help is on the way. 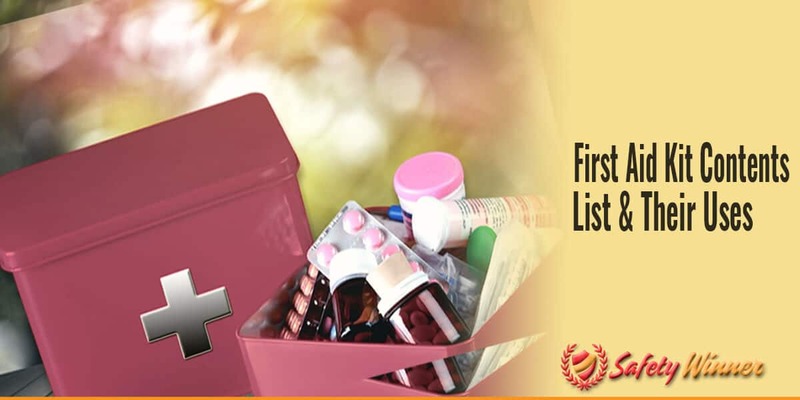 It’s important to note that although most general first aid kits only have a minimal number of products that aren’t specialized, every other type of first aid kit will have the same standard first aid kit products, as well as a variety of specialized products. In other words, these general products are the first aid kit standard. Alcohol-free wipes disinfect a wound. Ointment disinfects and kickstarts treatment of a wound. Pads clean the area around a wound, wipe away any liquid, or use with tape as a secured cushion. Gloves protect a wound from infection, as well as your hands. Masks protect your mouth from inhaling any fumes or particles. Plus, who wants to breath all over a person when you’re tending to their wound? While sterile and protective items are important materials for ensuring your first aid care is safe and sanitary, bandages and dressings are the most important items to ensure your wound has just the right amount of pressure and can adequately heal. Standard bandages are long, thin, and rolled up. This type of bandage is used to stop bleeding and act as support for joint injuries. Triangle bandagesare bandages that have a triangle shape. This type of bandage is easily foldable and perfect for sterilization or putting pressure on large wounds. Wound dressingis a large sterilized pad that is typically used for more major injuries. This type of dressing applies enough pressure to minimize or even stop bleeding while emergency services are on their way. Band aidsare typical bandages that are usually small in size. They have sticky ends and a plush middle that applies pressure, so a wound is covered and stops bleeding. Band aids are typically used for minor injuries. Pain relievers, such as Tylenol, which lessen pain from an injury. Scissors to cut bandages and other products that come rolled up. Tape to secure bandages and dressings. Tweezers to clean a wound. First aid guide where you can refer to product information and general step-by-step processes, so you can practice good first aid. Like previously stated, there are some specialized first aid kits. Specialized first aid kits are designed for certain situations. One of the most popular specialized first aid kits is a car first aid kit. Although the name is practically self-explanatory, if you’re unfamiliar with a car first aid kit, it’s basically a first aid kit that is designed to help you treat potential accidents that occur on the road. Mini compass that can tell directions in case you get lost or need to identify an area. CPR Mask that can help you revive someone in case they aren’t breathing. Poncho that will keep you dry. Glow stick that provides some light in case of an emergency and could also potentially alert others where you are. It should also be noted that car first aid kits come in either extremely compact or large sizes. Of course, the size is dependent upon the materials in the kit. Extremely compact car first aid kits are made to be as convenient as possible and fit under car seats or in the back pockets of car seats. On the other hand, extremely large car first aid kits are designed to be stored in the trunk of a car and generally have any item you would need in case of an auto emergency. Outdoor first aid kits are another popular type of specialized first aid kits. Just like the name, outdoor first aid kits are designed to help you treat any injury that might occur during an outdoor excursion. Flashlight to illuminate an area in case you don’t have access to light or get lost. Matches that act as a source of light or heat. Plastic bags that will keep you dry or act as trash bags. Blanket that will protect you and keep you warm. Whistle that can help you alert other people nearby that you need help. Overall, although there are various types of first aid kits, every first aid kit comes with standard materials that are designed to treat minor to semi-serious injuries. While general first aid kits are designed to be used at home, there are certain first aid kits that are designed for specific occasions or activities, such as travel, hiking, and auto first aid kits. Ultimately, the type of first aid kit you purchase is dependent upon your personal needs and desires. But, hopefully this article helped you identify the basic items you should look for in a first aid kit!